Moving interstate to a new city could be both an exciting and terrible experience for you. If you’re planning for a house or office relocation in Geelong, here’s all you need to know about Geelong as a handy place. In the past, many citizens of Geelong have been moved to Melbourne, Brisbane, Canberra, and many other popular cities and states for better job opportunities. But nowadays this broad trend is reversed as a large group of people across the country now prefer to relocate to Geelong than any other city or state. The reasons are quite simple and practical, as this beautiful city provides the more affordable lifestyle to all those families who are seeking smaller mortgage and accessibility to shopping malls, quality schools, hospitals, and many other needful facilities. Not only that, but Geelong also provides the necessary facilities and amenities to run any business office. It is well connected to all major cities and suburbs of Victoria, just 20 minutes away from the beach and just a train away from Melbourne. 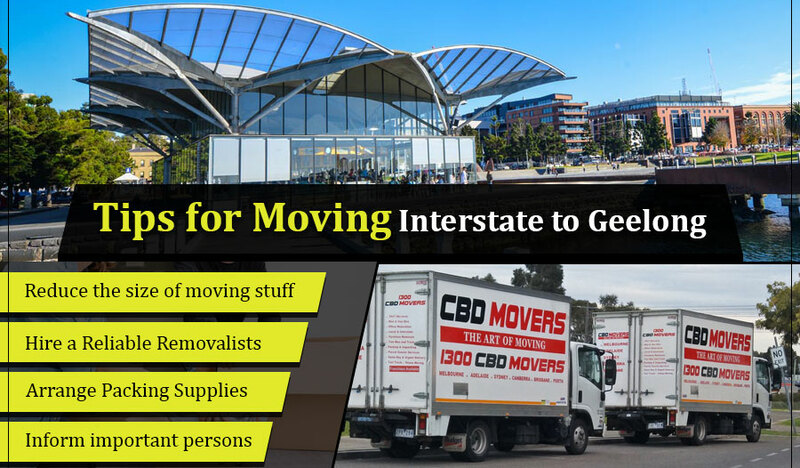 At CBD Movers, our professional movers Geelong are fully-equipped and having all needful expertise to help you make your local or interstate move as easy and stress-free as possible. Here, we’ve put together pretty handy tips for saving your time, efforts, and money. If you want to avoid the nightmarish moving experience, it’s in your best interest to start your preparation early at least 5 weeks ahead of the moving day. Arrange Packing Supplies: Arrange good quality packing boxes and supplies to according to the size of your moving stuff so that you can properly pack and keep all your belongings safely in one piece on a moving day. You can ask your friends, retail stores or a Furniture Removalists Company to provide you good quality cardboard or plastic boxes either free of cost or with nominal charges. Do not forget to arrange Bubble-wrap to protect your fragile and delicate during relocation. Also, try to keep the bubble wrap hidden to protect it from bursting too soon until the packing day arrives. A professional removalists Geelong can charge you according to the size of your stuff. More stuff means spending more time, more effort, and more money on the removals Highton Geelong, packaging, and transportation. There is no reason to waste your time, effort, and money to pack and move extra stuff along with you. So, clear up all those items that you do not require anymore either by selling it online or holding a garage sale. This not only will help you reduce the size of your moving goods but also help you make some extra cash by selling your excess stuff online or holding a garage sale. Preparing early for the move will spare you plenty of time to compare several quotes and select a reliable Moving company Lara Geelong. Remember to read testimonial before hiring any Moving Services. Also, confirm if the company offers insurance cover for your affiliation? Inform all local offices such as post office, insurance, transport, gas services, and others about your relocation. You can forward an email to request the concerned authorities change or transfer your current address with a new one. It always makes sense to inform important people and organizations about your house or office relocation in Geelong that might include banks, doctor, dentist, veterinarian, electoral office gyms and clubs, etc. Remember to request your local vendors to stop delivery for milk, newspaper, and grocery items. Start your packing job at least a week before the moving day. Start packing items in the cardboard boxes you don’t need frequently. Keep items such as toiletries, cosmetics, eatables, driving license, keys, currency, etc. handy with you as you may require them a night before and during an interstate journey. Conclusively, if you are planning to move to Geelong and want to make your interstate move a lifetime experience keep all above tips handy with you. For professional moving services, feel free to call us to hire our experienced and friendly House movers Grovedale, Geelong, and experience a smooth and safe transfer. Previous PostPrevious Important Factors to consider before deciding on your moving date.